This version of the exercise ball hamstring curl requires your to start in the bridge position with arms pointing toward the ceiling. Don't let your knees lock out completely. The hamstring curl here requires you to maintain your neutral spinal position while putting you limbs and pelvis into different positions. You need to have good awareness of where your pelvis and spine lie in space in order to achieve this. 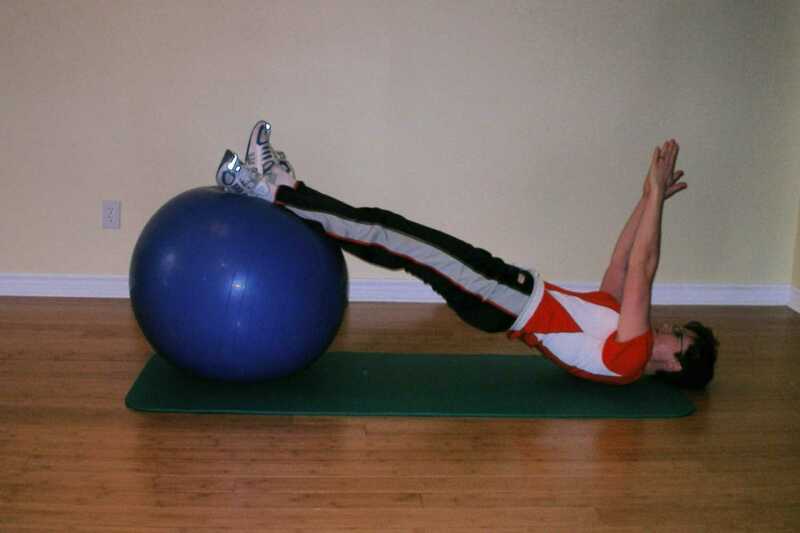 This version of the exercise ball hamstring curl is more difficult than the the preceding two with arms out, and arms in front, because your base of support is narrowed even further. If you are looking for even more of a challenge you could try this curl with one leg as in the single leg hamstring curl linked above, only raise your arms toward the ceiling as well. If you just need a little bit of help with this exercise you can try letting some air out of your ball or using a smaller ball. Repeat this ball exercise 20 times. Repeat this ball exercise 30 times.